The 4” Tile Grip from Bridge Medical easily installs and removes without any tools or professional installation. The powerful commercial-grade rubber suction cups strongly adhere to smooth, flat, non-porous surfaces. It is the strongest and most reliable on the market today. 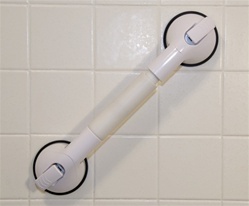 Telescoping Handle extends to adapt to most any tile configuration. Installs without tools or expensive professional installation. Tested and approved by health professionals including orthopedic surgeons and occupational therapists. High Quality 3.7" Rubber Suction Cups provide a very strong hold. Install and remove anytime just about anywhere.